Capercaillies are suffering of habitat loss all over Europe. Maybe even more than other species, because they cannot adapt. They only eat pine thorns and need old growth forest for their annual lek. Birds that lose their home to logging go mad and despite being very shy, become crazed and bold enough to attack even humans. The largest leks are situated in Russian taiga. According to an article I recently read, it was common to have 50+ bird leks in Estonia about 50 years ago. 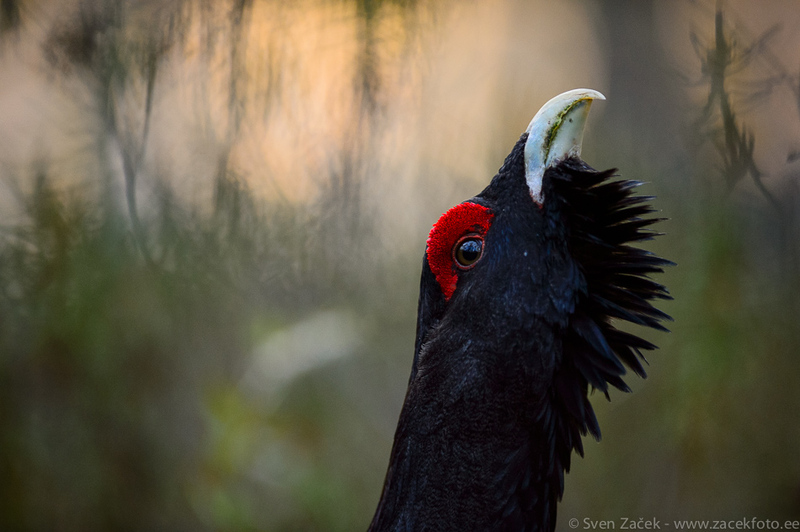 Now the largest lek is around 15 birds, but most lekking sites only host an annual “party” to 3 or 4 birds. That is very sad. Now, I have found an alarming situation. I found this bird in the heart of a nature reserved area, yet it had gone mad. There was old growth forest around it. Furthermore, it came down from a tree and started lekking in front of me. Sometimes we were really close. I hope this guy just had some trouble controlling the hormones this spring and it wasn’t mad because there was no one to fight with. Photo info - Spring: Nikon D4s + Nikkor 300mm F28 @ F28 1/640 ISO 2500.